The State Department on Tuesday defended efforts by the European Union to explicitly label goods produced by Jewish businesses in the West Bank. The EU moved to single out Jewish goods produced in disputed areas of the West Bank. Over the weekend, it adopted a new resolution stating "unequivocally and explicitly" that any European business deals with Israel cannot apply to Jewish communities in these disputed areas. Asked about the latest European moves, State Department spokesman John Kirby told reporters that they were in line with administration policy. "In terms of the issue with the agreements and omitting from them the West Bank and Gaza, you also, you think that that, you think that's okay?" Kirby was asked by Associated Press reporter Matthew Lee. "In other words, you agree with the EU that this does not indicate a boycott, or isn't a boycott, or won't lead to one?" The administration does not view the effort to label Israeli products as part of the larger movement to economically boycott Israel, Kirby said. Kirby went on to explain that the Obama administration is opposed to all Israeli settlement activity. "As you know our long-standing position on settlements is clear. We view Israeli settlement activity as illegitimate and counterproductive to the cause of peace," Kirby said. "We remain deeply concerned about Israel's current policy on settlements, including construction, planning, and retroactive legalizations." Critics of the administration blasted Kirby’s stance as the move meant to promote boycotts against Israel, part of a broader international campaign to isolate and delegitimize the Jewish state. Noah Pollak, executive director of the Emergency Committee for Israel, said on Twitter: "Today [the] Obama admin announce support for EU labeling of Israeli products, intended as a first step in boycott. 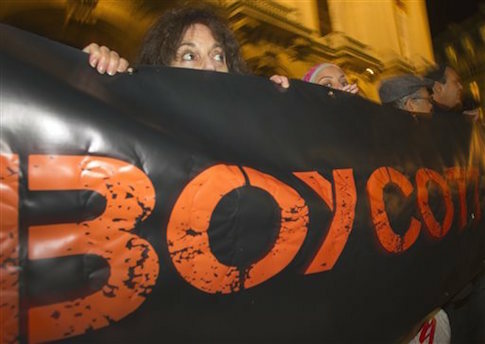 Obama admin supports [boycotts, divestment, and sanctions]." So today Obama admin announced support for EU labeling of Israeli products, intended as first step in boycott. Obama admin supports BDS. Omri Ceren, managing director at The Israel Project, also weighed in, stating: "Today was when… admin came out in support of slapping labels on Jewish goods from [the] West Bank" and noted that the stance would reinforce long-standing rumors that the Obama administration had been secretly coordinating with the Europeans to pressure Israel while denying that coordination in public. Just as marker for record, today was when most pro-Israel admin ever came out in support of slapping labels on Jewish goods from West Bank. Lots of people believe Obama admin coordinated w/ EU on labeling while denying in public. @statedeptspox stmt will be taken as confirmation. Kirby had insisted at the hearing that the administration’s support for the labeling did not constitute support for efforts to boycott Israel. The EU has "made clear that they oppose boycotts against Israel," he said. "We do not view labeling the origin of products as being from the settlements a boycott of Israel. We also do not believe that labeling the origin of products is equivalent to a boycott."